Following a BA in mathematics, a Master's degree in Statistics and a doctorate in Operations Research, he has spent over 30 years working in satellite communications. Since 1978, he has been associated with the Chimaya Mission in Washington, DC and he is now using his skills in problem solving and background in the use of mathematical tools to try to state the teachings of Vedanta mathematically. The results of these studies from 2000 - 2007 have been presented in papers at various conferences. I found this to be a strange and unexpected book. Overall, I can highly recommend it but I do have several significant reservations. Firstly, I would never have thought that a book with a title such as this would have been about advaita. In fact, I am at a loss as to the intended target audience. The first part of the title might appeal to a 'New Agey' readership but then the second part of the title would almost certainly put them off. Even the words 'mathematics' and 'spirituality' are contradictory in most people's minds! And those who are scientifically inclined would probably not be tempted to pick up a book whose title implied that ‘love’ could somehow be made into a law. Anyone who is able to get as far as picking up the book to look at it is very likely to be dissuaded from purchasing it once they see the differential equations and graphs which constitute a large part of the second section of the book. And, again, those who are able easily to understand the mathematics are probably statistically less likely to be interested in the subject matter. I myself have an A-level GCE in mathematics and had to study some quantum mechanics and further mathematics as part of my chemistry degree. But this was many years ago, and I have not had to use any of it since then. On the inside sleeve of the cover, the endorsement states that: "it is simple enough to understand with some basic knowledge of mathematics". I'm afraid that I found most of it to be quite unintelligible and also lacked any real incentive for making the effort. I certainly would not agree that only a ‘basic’ knowledge is required! The book itself is divided into three sections, and it is only the second section that contains the mathematics. Part one, consisting of 73 pages, is actually a brilliantly lucid presentation of the essential concepts of advaita. The language used is the precise, matter-of-fact style of a scientific textbook and it works very well indeed, showing that the principles can be put forward in a manner which can appeal to any intelligent but interested layman. And it is completely up to date in respect of its acknowledgement of the findings of modern science, showing that there is no conflict. Part two is the mathematical representation, and covers 138 pages. A number of major aspects of advaita are covered and attempts made to symbolize these using the terminology of mathematics. I could copy some of the integral equations and explain what each of the terms stands for but, as pointed out above, their meaning is quite beyond me. Moreover (and here, I do have to acknowledge that it is not entirely reasonable to make such an objection when I haven't read the text), I do not really see the point of attempting to explain human behavior and the spiritual path in this manner. It seems to me that, given that it is even difficult to describe this in words, it must be impossible to do so through rigorous mathematical formulae. And why should we want to, when all is mithyA? Part three has 33 pages and is divided into three chapters. The first one looks at some of life's 'conundrums', such as why there is evil and suffering in the world. The second chapter looks more closely at the difference between shreyas and preyas and makes a case for using love as a currency for worldly transactions rather than money! Ordinarily, pointing out that such was the topic of a chapter would be sufficient to prevent me from even looking at it! It seems to hark back to the naive aspirations of the 'flower power' of the late 1960s. But such is the quality of the writing and the reasoning skills of the author that he actually presents a very good case! The final chapter suggests scope for further research and education to continue the ideas presented in the book. This is a hardback book (also available in soft copy and electronic versions) and is beautifully presented with a brief foreword by Swami Tejomayananda of Chinmaya mission. There is a full list of references and a glossary of the Sanskrit terms used in the book but there is no index. In conclusion, I have to say that I do not expect the book to sell well because of the problems I indicated above. I would have suggested to the author that he omit the mathematics altogether (even though this is, in a sense, the raison d’être of the book and I can hardly imagine the vast amount of effort that must have been involved in constructing the equations) and think of a more descriptive title, less open to misrepresentation in the minds of potential reader. To that potential reader, however, I would say "buy this book if you want a clear, short but authoritative summary of what advaita Vedanta is about – and ignore the mathematics!" To those (assumed rare) persons who are interested in Advaita and who do understand advanced mathematics, I would say this must be the book you have been looking for all of your life! Given the quality of everything else, I can certainly believe that the standard of the mathematics is equally high and that the presentation deserves close examination. Dennis finds the book “strange and unexpected”. I had anticipated some such reaction since the book was sort of a surprise to me also. Had someone asked me a few years ago about the chances of there being a mathematical analysis of human spirituality, I would have said that it was very low. I do not claim my book is the best one can do with mathematics in spirituality, but its existence proves that a mathematical approach to spirituality is feasible. The answer to Dennis’s question about the intended target audience is available in his own later observation that “To those (assumed rare) persons who are interested in advaita Vedanta and who do understand advanced mathematics, I would say that this must be the book you have been waiting for.” This group may not be numerous, but it is my hope that they will not only buy and read the book but also will come forward with own ideas for a better and more comprehensive model. As noted in Chapter 12 of the book, there are several interesting problems waiting further work. The phenomenal progress in physical sciences is in no small measure due to the reasoning power of mathematics. But can it be effective in the case of Vedanta, the science of spirituality? In particular, as Dennis asks, can it be more effective than verbal reasoning which alone has been used so far in Vedanta? It is premature to make a general judgment based on a book which, after all, is only a preliminary attempt at representing Vedantic principles through mathematics. However, I should say that even the first attempt has turned out to be more successful than I had reason to expect. 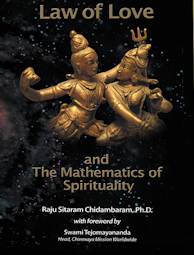 The book illustrates the unique benefits that mathematics can bring to our understanding of spirituality. One is in the way mathematics excels in revealing the precise relationship among the various variables or concepts considered important to a field of study. An example is the relationship between vairagya (spiritual detachment) and vasanas (sub-conscious tendencies) established in Chapter 8. The other, in Chapter 7, is the quantitative assessment of the personal will power required in spiritual progress. Generally speaking, such relationships cannot be established by verbal reasoning only. Another success of the book has been its ability to demonstrate how naturally the parallels between Vedanta and modern physics emerge when we present the basic Vedantic concepts within a mathematical framework. Table 6.1 lists the striking similarities between Einstein’s space-time continuum and Vedanta’s Mahat or Cosmic Mind and between physics of matter and spirituality of the jīvas. Several eminent physicists like Schrodinger and Bohm have commented on this subject in the past, but some of the specific details shown in Table 6.1 are probably new. Of particular interest here is the “Law of Love” over which Dennis expresses some puzzlement. Stated in words this law reads: “As a jiva (individual) becomes more and more loving, it suffers less and less in the world.” As it turns out, this fundamental law of spirituality relating Love and suffering is identical in its mathematical structure to the law relating space and time in the Special Relativity theory. When I displayed the graph of Love vs. Suffering (Figure 6.2 in the book) to a group of graduate students in the Indian Institute of Technology in Chennai, India earlier this year, one perceptive student quickly identified a feature of the graph: That the rewards of spiritual practice are slow to come initially, but if one is persistent in efforts, there comes a point when progress and rewards come more and more rapidly. I do not know if there is a discussion in any Vedanta text to support or deny this observation. But you will agree that this conjecture bears further examination and, if shown real, it adds an important new insight into our spiritual nature. In Chapter 12, I have indicated other hitherto unexamined problems in spirituality which the mathematics has suggested. These problems are not all theoretical, but have practical significance in the jiva’s spiritual pursuit, and yet seem to have so far received less than the attention they deserve from Vedantins. In short, I believe there is some exciting new territory awaiting exploration in spiritual science. This book will hopefully stimulate some readers to undertake that adventure. Reading through a mathematical work no doubt calls for some effort, but the potential to make contributions to a field as important as spirituality should be compensation enough.